This morning I noticed a quote I had made in an earlier piece this week was one of two quotes selected for “The Chatter” on page 2 of the NYT SundayBusiness section. Forgive this exercise in narcissism but I learned a few things from the process. Today’s quote mention gave me pause and since I’m midway through our quarterly market report gauntlet I thought I’d take a quick moment to comment on the thrill I experienced this past Tuesday contributing to Liz Harris’ cover story on housing market inventory (lack thereof). 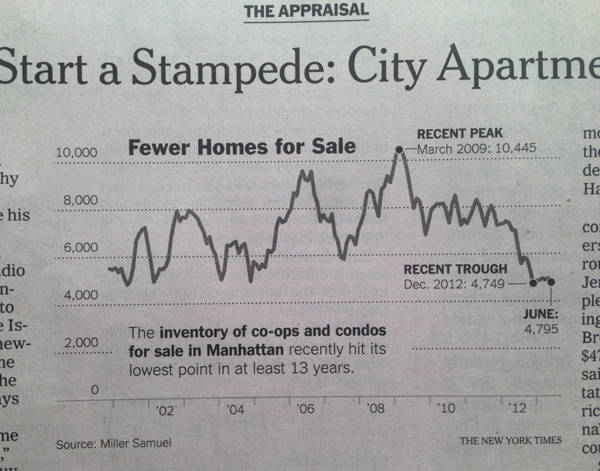 It was titled Words to Start a Stampede: New York Apartment for Sale. Liz writes an excellent weekly column with clearly the best title in all of journalism: The Appraisal. On Tuesday (7/2) I was initially contacted for the piece, beginning a weeklong period of handwringing. At that time I was told it would run on Saturday’s cover (7/6) which seemed like a long time away. 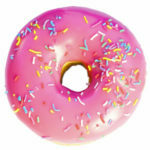 However the topic is evergreen (not time sensitive to the day) so it was likely “on the bubble” (pun sort of intended) if any last minute breaking news appeared. On Friday afternoon (7/5) I learned that Saturday was pushed to Sunday to make room for the crisis in Egypt. Late Saturday (7/6) evening I learned that Sunday was pushed to Monday to make room for the plane crash at SFO airport. Late Sunday (7/7) evening I was told that Monday was pulled because former NY governor Eliot Spitzer announced his candidacy for NYC Comptroller and no word on whether it would appear in Tuesday’s edition. On Monday (7/8) I was clearly hoping for a slow news day so the piece wouldn’t get bumped a fourth time so every news alert required my attention. By the time Monday afternoon rolled around, the article suddenly appeared online so I became confident it would never make the cover – but no page number was assigned to a print page. The online article appeared on the NYT “Most Popular” page, reaching 13th place quickly soon after it was posted and rapidly ascended to number 4, finally surpassing the very popular article about stool. I assume this was a way for the NYT to test via crowd sourcing how relevant this story was to deserve a spot on page one. The online article jumped to 2nd place, then 1st on the most emailed list so I began to feel confident that this was the feedback the editors needed. …and we were still ahead of the stool article. My company and I were both officially sourced (as well as Douglas Elliman for whom I write my report series) on A1 for the 12th time since 2000 (about .9/year). On Tuesday morning (7/9) my parents texted me at 6:08am to say they saw the printed version in their town drug store. The article actually made both the NY Metro edition and the US edition so I could share the fun with my relatives outside the NYC area, where social norms are a lot less obsessive about real estate. I’ve been talking a lot about the causes of falling inventory lately and some mortgage industry types seem to resistant to the idea that credit is keeping supply off the market, versus some sort of uniform national paralysis or sales surge (sales arent’ rising nearly as fast as inventory is falling). 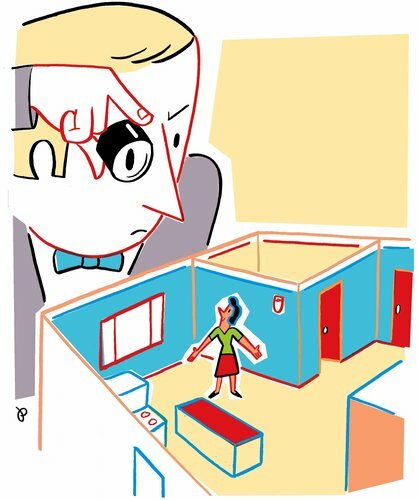 Michelle Higgins at New York Times does a nice feature piece: Dear Owner: Please Sell: Faced With Apartment Shortage, Brokers Get Creative on how this shortage of inventory is changing the way brokers work to get inventory to sell. 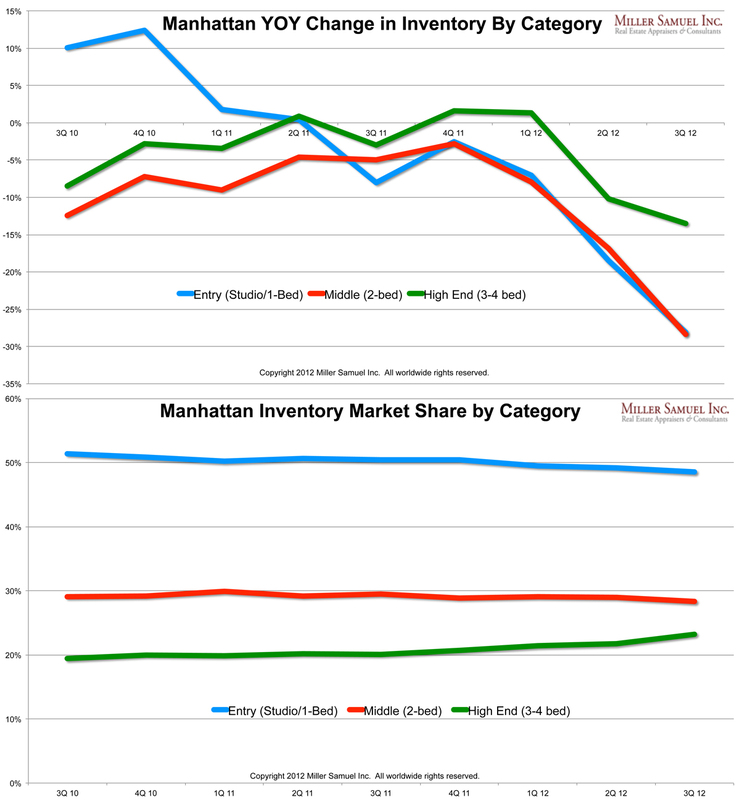 But seriously, you’ve got to love the chart (at top) in the article – we provided ten year’s worth of monthly inventory trends to show the visual of just how low inventory has fallen. 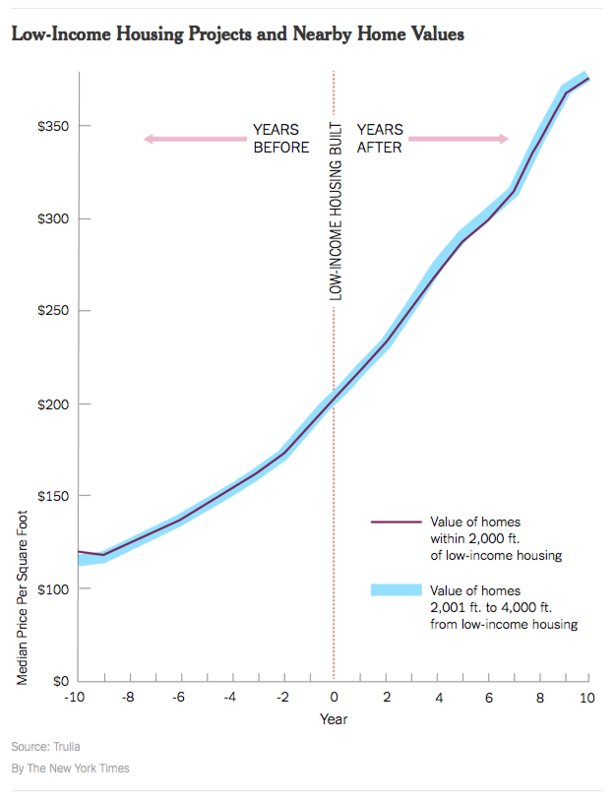 What’s amazing is the drop is happening in virtually every housing market I can think of. Since credit is a national market and housing is local, I view this phenomenon as a byproduct of tight credit. [NYT Business Day Live] Luxury Real Estate As Art? 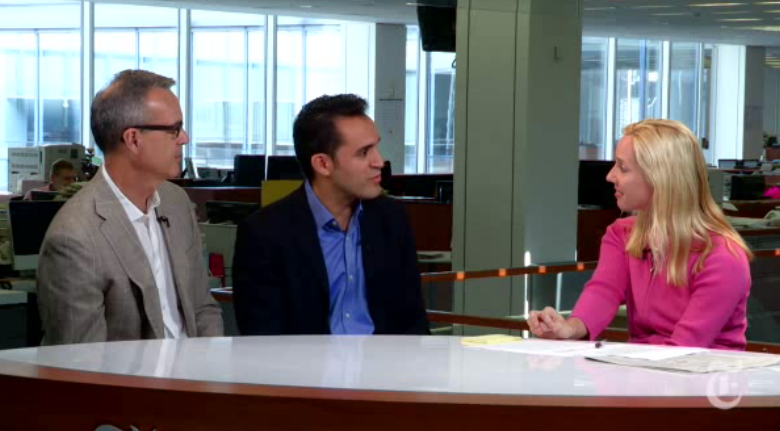 I enjoyed the interview of James B. Stewart and Alexei Barrionuevo by Louise Story (best last name a reporter could ever have), on the topic of luxury real estate in the New York Times Business Day Live video series. Mr. Stewart (author of Den of Thieves – one of my favorite books of all time) penned “The Market for Real Estate Masterpieces” exploring the idea of high end real estate as art based on Alexei’s high end housing market coverage of the past year, including the $100M listing (including the upset interior designer), the $88M sale and the >$90M contract among others. 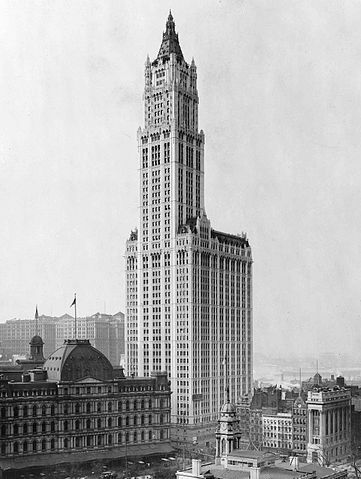 A real estate article by Michelle Higgins on the Woolworth Building Condo Conversion: Luxury Living in Old Temple of the 5 and Dime made the cover of the New York Times today. Not to wear out the use of irony here but the very idea that multi-million dollar homes will be located in the crowned jewel of nickel and dime retail sales is a bit mind boggling in retrospect. Our company got a nice mention for the Manhattan zip code data we have been been tracking for the NYT for years. They’ve got a nice interface to slice and dice the data. This is our 10th mention on A1 (I’m a numbers guy so I count everything) and I can assure you it never gets old. This weekend I was quoted in the New York Times article “Shooting for the Moon” by Alexei Barrioneuvo which explored some of the crazy prices being asked at the top of the market. Appraisers come across list prices every day that have no rhyme or reason to them. 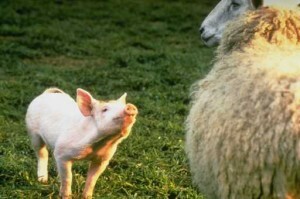 In providing this quote, I sort of felt like I was in the movie “Babe” which I saw with my kids years ago (admittedly, I liked that movie) sharing that “secret word” that Babe used to get the sheep to talk to him. At the high end of the market, sometimes this approach is successful, but in reality, it is more often successful in new development than re-sales because of the concentrated marketing effort in place and that it is “new” with no benchmark bias already established. Another name for it (and I just made this up) could be “unprecedented pricing” or UP. 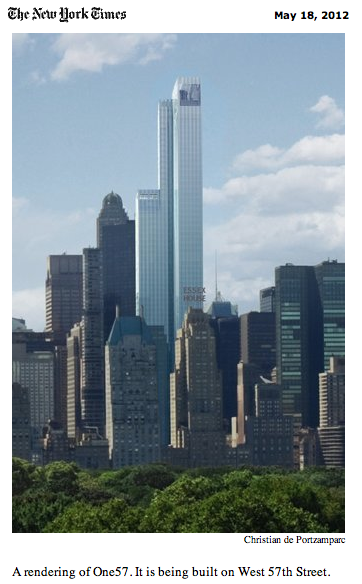 Buildings like 15 CPW and One57 in Manhattan and One Hyde Park in London had no real comparable benchmarks and became their own market. 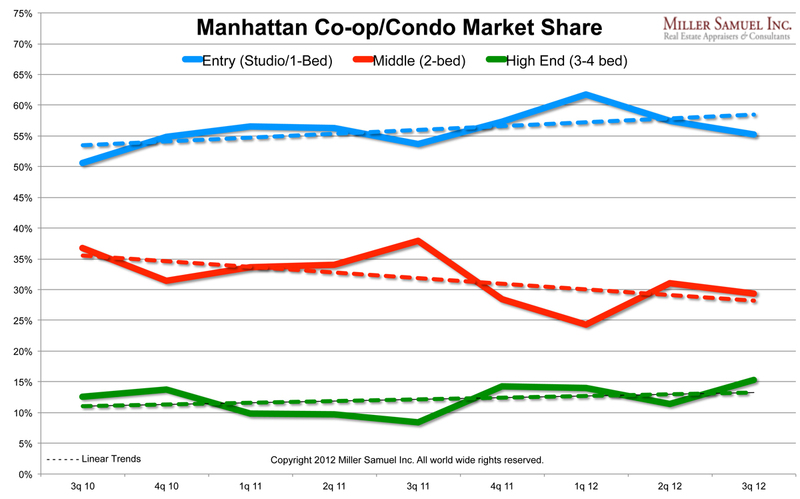 Last week’s Manhattan housing market certainly ended on a high note – literally. You know that old saying about things happening in threes? My word of the week is “trifecta” – it’s always been a favorite, along with “neat, blowhard and Muttontown. I spoke about The $70M Condo versus $52M Co-op Smackdown, Manhattan Style last week but there is another big sale to make headlines was scooped by Alexei Barrionuevo at the New York Times. Alexei corrected me on my Twitter feed that the price was “over” 90M. It’s all quite breathtaking when you look at this sale in context of the entire market. However what sets the last 3 sales of $52.5M, $70M and $90M+ apart is they all exceed 10k square feet. The recent $88M sale was a nominal 6,744 square feet. This record sale won’t close until the building construction is completed next year or so and I am not so sure it will still be a record at that point. 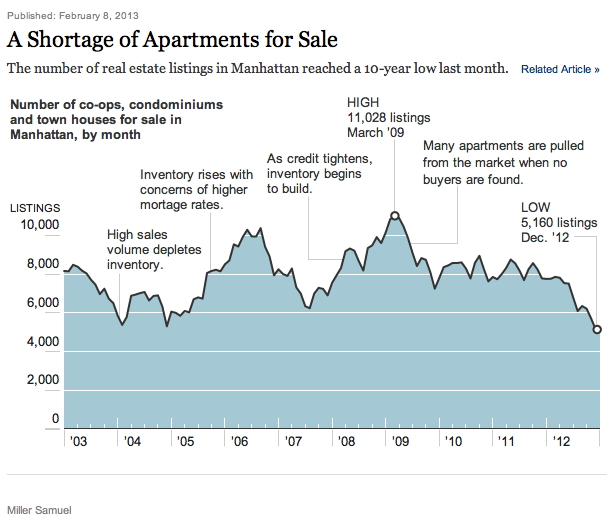 The New York Times Real Estate section has been upgrading and tweaking the stats they provide on their listing database. The chart above shows the trend line for the number of listings seeing price reductions and increases. Increases remain nominal and constant while the number of listings with price decreases nearly doubles since the beginning of the year. One thought I had is that more sellers thought prices were going to rise throughout the spring with the volume surge and set prices too high (a phenomenon I discussed in my 1Q 2010 report). When that strategy met resistance from buyers, a rising number of sellers capitulated and dropped their prices resulting in a leveling off of sales activity in April. Here’s the NYTimes.com/realestate search window I used for the analysis that can be embedded. In the New York City metro area, prices were generally stable – the story this spring was really all about transactions. In today’s New York Times, Vivian Toy’s piece: Spring Real Estate Market Roars In but Tiptoes Out Early describes the robust sales activity that occurred in the first three months of the year but peaked by mid-April, two months early. Sales continued to remain elevated through May and June, however. Does this mean that the market is poised to slip? Housing sales activity rose across the country in March and April, in anticipation of the April 30 deadline for the $8,000 first-time buyers’ tax credit. But economists and brokers say the tax credit was probably a less powerful incentive in Manhattan, where the average sales price for an apartment is $1.4 million. And price metrics are rising. Seeing another sign that the market is on the mend, Pamela Liebman, the president of the Corcoran Group, said that the average price on signed contracts at Corcoran had climbed to $1.5 million in May, from $1.31 million in February. However, it is important not to confuse this increase with rising prices. The high end market simply “woke up” in the beginning of the year and is skewing the overall numbers. We saw this happen to our 1Q 2010 market stats. Plus its a seasonal phenomenon to see the aggregate numbers rise in the spring. But nationally, housing market indecision is on the rise.